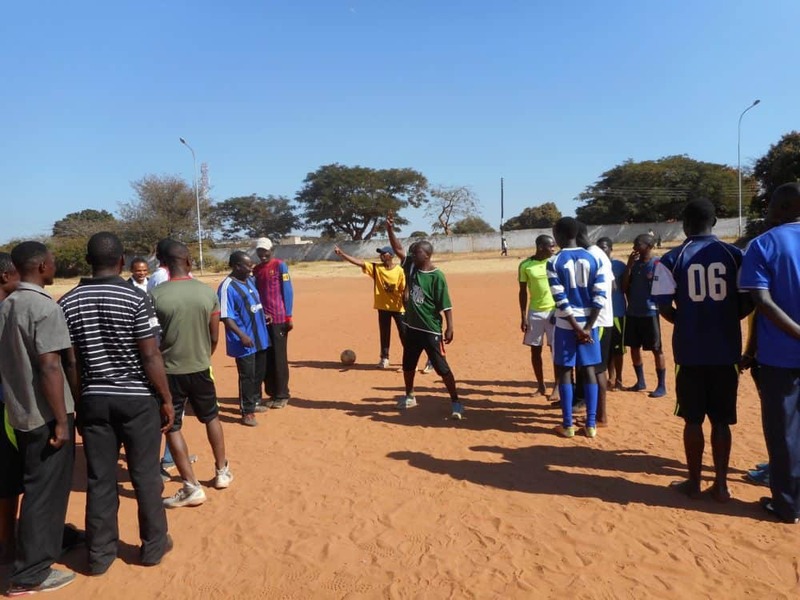 Community Impact Coach Frank Chivawura, from Zimbabwe, writes about his work with CAC and New Hope Waves in Livingstone, Zambia. July 5th 2016. The amazing thing about sport is that despite our differences, it brings us together. I was privileged to meet with Nora, Carrie and Nico, the CAC coaches at Harare’s Prince Edwards Boys High where they were facilitating a Coaches Across Continents (CAC) training in Zimbabwe, in conjunction with Sports Recreation Commission of Zimbabwe. The experience in Zambia would not have been the same without this vibrant group. It was a long journey from Zimbabwe, Harare to Livingstone, Zambia. Nico and I left for Zambia at 17:00hrs only to arrive in Livingstone, Zambia at 07:30 the following morning. This was my second time as a Community Impact Coach (CIC) but my first time travelling internationally with Coaches Across Continents. It was an exciting week in Livingstone. CAC was working with the New Hope Waves in the sandy Namatama grounds of Maramba. Being the second time as a CIC, the first time being in my country Zimbabwe, I had thought that all was going to be the same as the last time, but I was wrong. It was a different country, place, ground, different CAC coaches, and even the way the curriculum was delivered was different and more exciting. I had the opportunity to train more than 30 community coaches who were a delight to work with. They were passionate and very eager to learn more games. What excited me the most was the feedback we had every morning when the coaches came to the field for training. From the day we started training with the few games that the coaches learnt, the games were already being implemented. 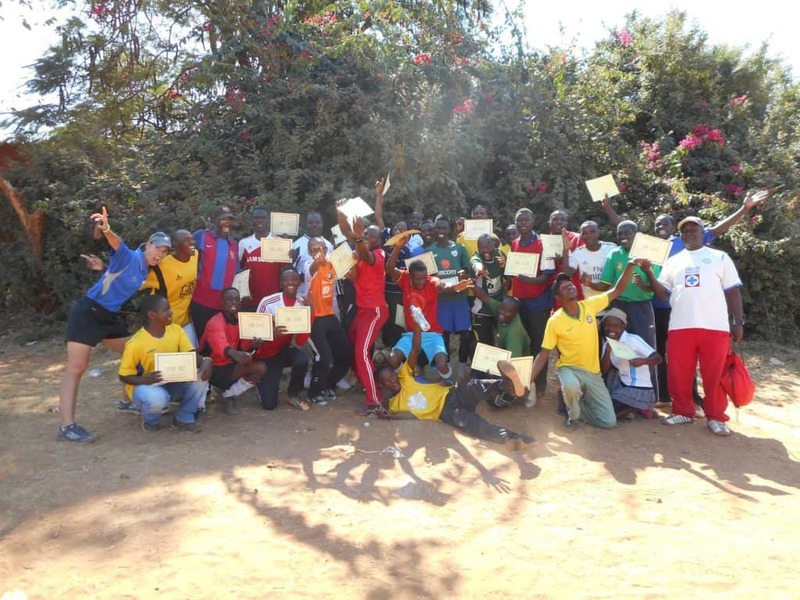 Some of the coaches had teams they were training in the afternoons and the CAC games were already being used. It made me feel so warm inside. I felt so much confidence and it made me realise that it can only take but a few to change the way people think in life. Already, I could see change in the coaches. Coaches started coming early and could not wait to start training. And in the afternoons they implemented what they had learnt. All this made me recall this statement from one of the CAC leaders Adam Burgess, “being on the field when you see children and coaches smiling you know that learning is taking place”. Coaches were smiling and so excited to know what was coming next which was a good sign. Even When Nora, who was leading our group, asked for the coaches to go for water breaks, on several occasions you would hear the coaches saying ‘no no let’s move on we need more games’. Nora made it all easy for me as she was supportive and was always encouraging coaches. Her ways of coaching were different and yet educating and very exciting. She made coaches laugh doing her cuckoo dance which was hilarious. CAC volunteer Carrie Taylor was calm and firm. She made the whole week wonderful with the unique way she used Children’s Rights in coaching games. And CIC Nico from Tanzania was full of fun. This team was great and I learnt a lot through each and every game they taught. On the last day of training during the coach backs, I was so impressed by the way the games were being adapted. One of the groups led by Musso performed the Children’s Rights game in a different way. They had four areas that represented different child rights and what was beautiful and touching was that the group changed the way the game was played and brought in hand ball. In the game they used hands instead of feet. The rule was before passing the ball you should first touch the ground with the ball then pass. The team would score points by receiving the ball in the grid and the whole team has to shout the type of right the grid represented together. I was very excited to be part of this group and am so thankful to the organizers of CAC who made it possible for me to travel to Zambia which made me feel important and useful in the community. Sports for social impact will go a long way in changing people’s lives. Though there is still a lot of work to be done in our communities, this initiative will help a lot of people, teachers, coaches and students play their part in their communities. Just missing the fun in coaches across continents meeting .coach Nico long time when are you coming back to Uganda?? ?